Two bombs exploded near the finish line of the Boston Marathon Monday. The blasts killed three people and wounded more than 125 others. A law enforcement source told CBS News correspondent Bob Orr that the devices were likely hidden in trash cans. The explosion went off at the most crowded points of the race. Police rushed to assist victims, some missing limbs, tangled in debris and broken glass. Bill Iffrrig of Washington state was knocked down by one of the blasts. He got up and finished the race and then walked to his hotel. Bombing witness: "I was very lucky today"
Demi Clark of North Carolina was crossing the finish line as the first of two explosions went off. She described to CBSNews.com's Brian Montopoli what the scene was like in the moments after the blasts. Footage courtesy of The Boston Globe captured the sight of the first blast and the sound of the second, which was further down the racecourse. The second explosion went off a block away from the first blast. Steve Silva, a senior sports producer at Boston.com, was at the scene of the bombing. He described the scene that he filmed on his video camera. Jonathan Elias, a reporter for CBS Boston station WBZ-TV, was on Boyleston Street as the bombs went off. He described the grievous injuries and horrific situation as it happened. Kylie Atwood, a producer for CBS News, was on Boyleston Street when the bombs went off. 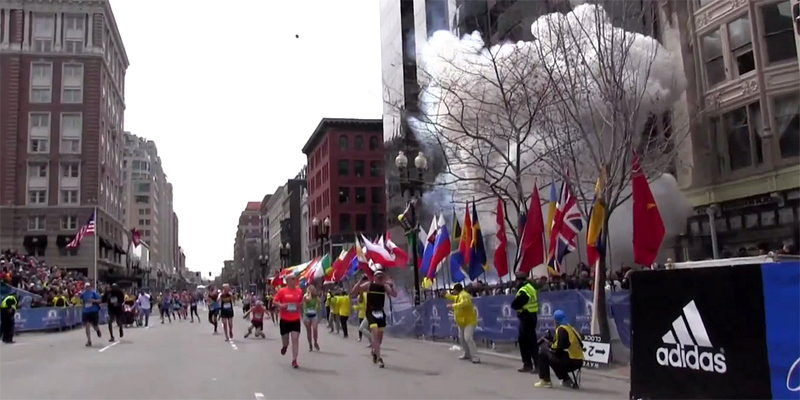 She described what she saw as she ran toward the second explosion. Obama on Boston bombings: "We don't know who did this or why"
Following the explosions, President Obama announced all resources of the federal government have been directed to help state and local authorities to "protect our people, increase security around the U.S. as necessary and investigate what happened." Toomey: "Tragedy has struck at the Boston Marathon"
Appearing on the Senate floor to push his amendment that would tighten background checks for gun sales, Sen. Pat Toomey, R-Pa., informed the body of the explosions. On the floor for a vote, Senate Majority Leader Harry Reid, D-Nev., held a moment of silence for the victims of explosions.